Need inspiration for a digital display campaign? Oracle recently bought a little known internet company called Moat.com. It lets users search for web banner advertisements by brand. Most web media designers are employed full-time by expensive web agencies. Your regular wordpress developer often prefers to focus on the technical side, and even exclusively on websites – which makes it difficult to get a compelling display banner ad for your campaign. Researching what’s out there by the main players in your industry lets you research a really thorough brief. This makes it much more achievable for a designer to create something stunning. Everyone is busy. C-suite decision-makers are usually not available to take a call. It doesn’t matter how good your pitch is if nobody gets to hear it. Traditionally, glossy direct marketing pieces in attractive boxes were considered the way to capture your prospect’s attention. The cost was huge. If you have a really compelling message, there is a simple way to get it across. This approach can be used to access sales decision-makers, court the press or head-hunt a candidate. A custom, pre-recorded MP3 lets the customer hear what you have to say. They can listen on their smartphone while moving between meetings. It could be hosted and linked with SoundCloud or emailed directly. A basic example is start with a voicemail and add the audio from your company video. For a more sophisticated approach, first practise and perfect your script. Then use audio editing to personalise, update and reuse the same recording every time. You could even add a background soundtrack. All this can be created with free tools or save time by outsourcing to a marketing freelancer. A marketing team with large budgets receives lots of mailshots. Everything is trying to get your attention. One piece I remember vividly was a simple letter with a lotto ticket enclosed. It’s impossible not to 1) check the ticket and 2) marvel at how the sender got your complete and undivided attention. It was also a very low budget execution for a B2B marketing campaign. In spite of it’s simplicity this technique has not been overused. And if you’d like to brainstorm new ideas for cold calling hot prospects, please get in touch. Apparently, it reflected badly on their employees. Even photos of the final billboard clearly show that it’s a representation of an uneven job, rather than actual misaligned poster sheets. Somebody, somewhere in the process took offence. It would have been much easier to manage the situation if the campaign had still been at the storyboard stage. As it happened, it had already eaten a significant portion of the 50K euro budget before the issue raised its head. The learning is that we can’t control everything. However, it’s a good idea to engage stakeholders early in the process. It’s a bad idea to sign off anything after 6pm on a Friday evening – especially if it’s for print. The human brain is simply not working at full capacity at the end of a frazzled week. Getting extra pairs of eyes for proofing can be helpful, but it’s not guaranteed to be foolproof. If the item is a branded giveaway or signage of any kind, every nuance of the logo must be considered, from the space around it, to the font, to the particular colour shade. See if you can guess which of these 2 logos is the correct one. It’s actually the first one, but it has nothing to do with the coloured part of the graphic. The double “M” is deliberately joined up in the official version. It’s possible the second version was created by someone who needed the logo quickly but didn’t have time to contact the organisers for the original. This week An Post (Irish Post Office) implemented a mailshot promo, but didn’t leave enough space for the Postcode (Eircode) on the entry form. With experience, we learn the best way to avoid these small mistakes. Often the simplest solution is to negotiate a Monday morning deadline. It makes a huge difference. When blogging was still a very new phenomenon, blogger-turned-journalist Sarah Carey was asked to describe it. She wisely defined it as a pen and paper. Infinite possibilities. Social media shares the same fluid definition. It’s easy to feel like a writer with a creative block. And yet there is significant pressure to use it as a revenue generating business tool. Richard Branson uses Facebook to cover his public charity work, climate change and beating poverty activity. He uses Google Plus to cover his business leadership and service launches. He stays in touch there with a close circle of those connected to his brand. That’s just one way to do it. Another effective way to use social media is to show what inspires you. A graphic designer might share pictures of visually striking and beautiful things that are not obvious to the average beholder. This proves she has a good eye for design. That’s a USP. A recruitment agency might share a commentary on the latest trade union negotiations, even if it has nothing to do with their industry. This shows they closely follow and understand the subtle science of negotiating, and could probably get you a better salary than you could negotiate on your own. So, with that in mind, here’s a marketing campaign that inspired me. Try watching this Herman Millern recruitment video and not visiting their website afterwards. I recently recorded an introduction to an exciting new podcast covering entrepreneurship with business leaders, startups and solopreneurs. Week numbers matter. There are 52 weeks in the year – that’s 13 x 4 weeks, and yet we only have 12 months. The 3 days difference between February and March can mean loosing over half of a working week. It can slip by unnoticed, leading to last minute panic. A simple solution is adding the week number to your Google Calendar. An extra bonus is that you can check the best before dates in Aldi. 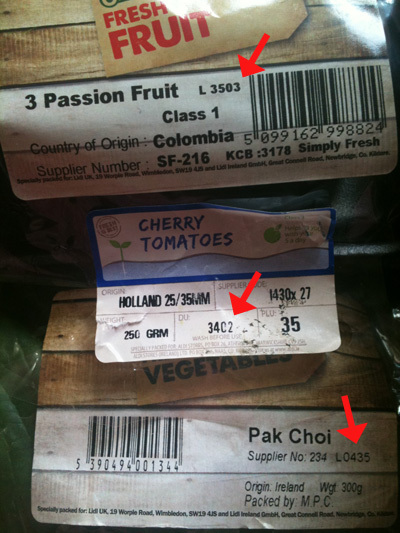 They label their fruit and veg by week number + day of the week. In the first example, 3503 means the 3rd day of the 35th week of the year – which commences August 29th – making the best before date August 31st. You won’t be fooled any longer! How to correct Youtube auto-generated captions? Auto captions are impressive, but deadly. A previous post showed an example of a brand name being interpreted phonetically, with hilarious consequences. From the list view in your Youtube Channel video manager, locate “Subtitles and CC”. Click on the circular, green button confirming the language setting. Preview the automatic captions and click edit from the bottom right. Click Overwrite and this will allow you to adjust text and timings. At the very least, check how the captioning has interpreted your brand name. Publish your changes. If you need to export your subtitles, use the actions menu on the top right to download an SRT file. By changing the extention name to .txt, you will be able to view or copy them to wordpad.